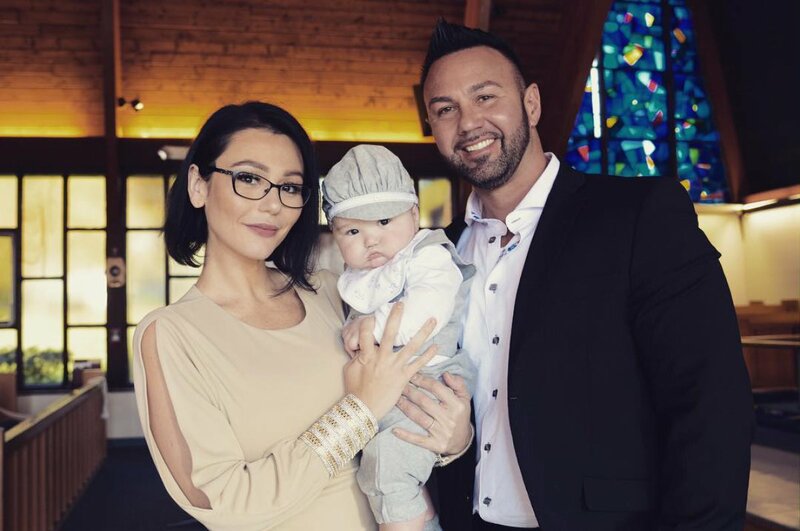 Jenni "JWoww" Farley and her husband Roger Mathews celebrated their son's baptism over the weekend. The 30-year-old "Jersey Shore" alum and Mathews, 41, had 6-month-old Greyson Valor baptized Sunday in New Jersey with their family and friends in attendance. "Very proud parents to this newly baptized Baby Beluga. Greyson Valor Mathews," Mathews captioned a photo of himself and Farley with their son the next day on Instagram. "Great weekend with family and friends. Thanks @apinard for the amazing pics and thanks to Greyson's God Parents @k8up and @ktenan12 for honoring us by being Greys God Parents," he added to another picture. Farley and Mathews welcomed their first child, daughter Meilani Alexandra, in 2014, and married the next year. Farley told her 4.7 million Instagram followers that Meilani was "too busy with her girlfriends" at the baptism to pose for photos. Farley had said after Greyson's birth in May that her family is "complete." She later told E! News that welcoming her second child has brought her closer together with Mathews. "We have so much more respect for each other now," the star said. "Roger is so hands on with both of them that it made me fall in love with him all over again." "We also learned to talk through disagreements rather than be stubborn or argue," she revealed. "We don't want our children to see us fighting. We want them to learn how to talk through things and grow from the experience." Farley came to fame on the MTV series "Jersey Shore" and has since appeared on "Snooki & JWoww," "Marriage Boot Camp: Reality Stars" and "Worst Cooks in America: Celebrity Edition." She and Nicole "Snooki" Polizzi presently star on the web series "#MomsWithAttitude."